NADIA M. WHITEHEAD | September 19, 2014 | UNIVERSITY COMMUNICATIONS. room," during the official opening Thursday, Sept. 18. Wander the halls of The University of Texas at El Paso's College of Engineering and you may happen upon students slipping into bright white suits, latex gloves, booties and caps. Covered from head to toe, they look like they're headed into surgery, but they're not about to poke or prod anyone on an operating table. Instead, these young engineers are gearing up to work in the University's latest research station: the Nanofabrication Facility. Also known as the "clean room," the $4.5 million workspace is home to delicate materials that are crucial for conducting experimental work on semiconductors – the building blocks of everyday electronics. "What the clean room does is similar to the way you think of an operating room: you need to clear out all the microbes to have a really clean environment for the patient," said David Zubia, Ph.D., an associate professor of electrical and computer engineering at UTEP who pushed for the development of the facility. "Here, it's a really clean environment for the things we're making." The materials – some of which are 100,000 times thinner than a single sheet of paper – are easily damaged by dust and other particles, so those who enter the facility are required to wear special attire; it helps contain the stray particles that typically fall from an individual's hair, skin and clothing. "Having a facility that allows us to work in the nanoscale world is essential to compete and to contribute to advances," said Richard Schoephoerster, Ph.D., dean of the College of Engineering. For instance, postdoctoral researcher Sergio Almeida, Ph.D., is trying to create a new device similar to a flash drive, but with significantly more memory storage. It will also be able to handle extreme environments like space where radiation can damage electrical components. But before the new facility opened, Almeida was forced to conduct his research in a room that was not 100 percent clean. "If even a single particle of dust got into the device, all of the hard work was wasted, which has happened to me," he admitted. "If I made 100 devices, only about two would actually work. Now, we're expecting to have a much higher yield; somewhere between 30 to 60 percent." 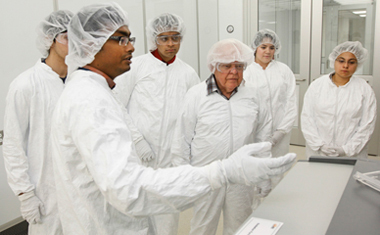 "I think (the clean room) is going to attract a lot of students and faculty who are interested in working with semiconductors," Almeida added. "There's nothing in this region like the clean room at UTEP." Researchers are not the only ones to benefit from the clean room. Electrical engineering students are able to take classes in the Nanofabrication Facility to learn how to manufacture semiconductors. Zubia recently led the first course in the workspace. There, UTEP students had the opportunity to make working transistors, devices that control electrical signals and are similar to the way an on and off switch works. Zubia says the class is an invaluable, hands-on experience for engineers who are getting ready to enter the workforce. UTEP engineers have been working with semiconductors for years now, but the recent completion and grand opening of the Nanofabrication Facility is expected to dramatically boost research outcomes. Other ongoing projects will take advantage of the facility, such as increasing the efficiency of solar cells in converting sunlight to electricity, and developing computer components that use less power and have longer battery durability. The new center was made possible by contributions from UTEP, the Texas Instruments Foundation and The University of Texas System.